This highly competent duo returns to bring us a memorable second act: Even with their first CD, featuring cello sonatas by Lalo, Ravel and Magnard, they received enthusiastic praise for the intelligent choice of repertoire and flawless execution. "Strongly recommended", was the English magazine "Gramophone's" emphatic endorsement. It is no surprise that the works of the Romanian George Enescu (1881 - 1955) are now on the program. For while Radutiu was born in Munich, he has Romanian roots. The two known sonatas by Enescu are joined by work dating from when the composer was 16 years old. 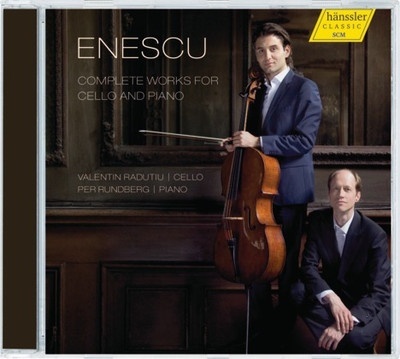 Enescu composed the piece during his student days in Paris, and it is presented here for the first time on CD. Both musicians are brilliant artists on their instruments. The cello tone is emphasized through Radutiu's soaring cantabile, a tone both elastic and wonderfully pure; his virtuosity is unmatched. Radutiu plays with a sense for gesture, but it never degenerates into display for its own sake. With him, the listener can sense the melancholy behind the strength. Everything keeps its complexity - and with it, the underlying power of the poetry.